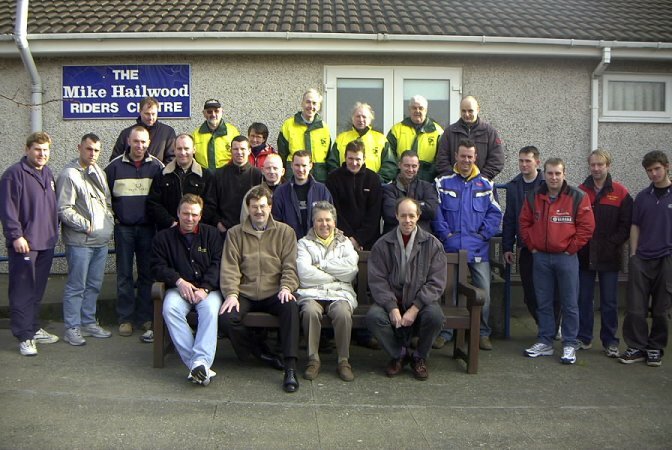 The Mike Hailwood Foundation 2003. Mike Hailwood Foundation supported riders 2003. Kevin Quirk, Harvey Garton, Dolly Garton, Neil Hanson (CoC), Des Evans, Fred Adlem, Alastair Bayley. Richard Mooney, James McCullough, Alex Donaldson, John Burrows, Pat Dufft, Colin Wilcox, Mark Castle, Davy Morgan, Darren Burns, Liam Quinn, Barry Davidson, Paul Earney, Dennis Booth, Guy Martin. Norman Gordon, Adrian Earnshaw, Geoff Duke, John Wastterson.